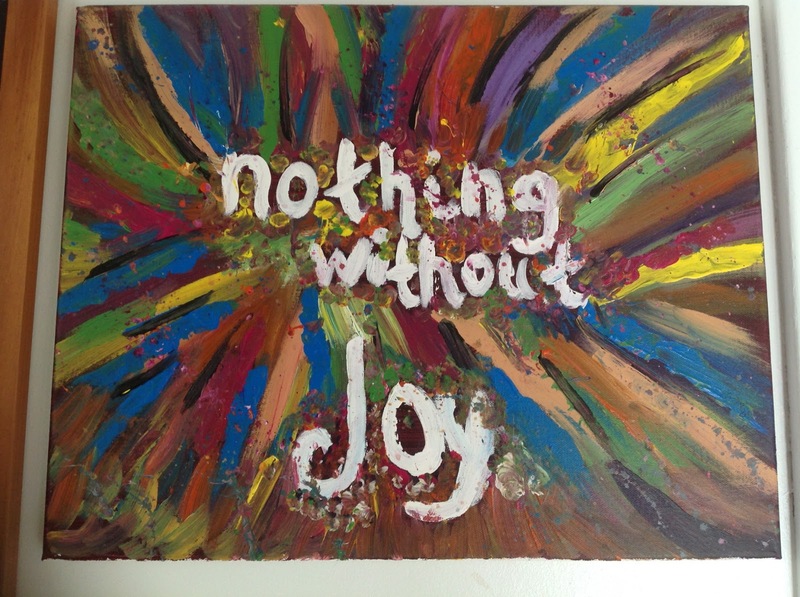 Rosalba's joyful interpretation of L. Malaguzzi's words. I stopped in awe when I saw it. A full two weeks since I attended the "Introduction to Reggio Inspired Practice" Summer Intensive course, I am still feeling buoyed by the excitement of this transformational learning journey. Back home, talking to colleagues and friends about what made this course so different, I kept coming back to two things: the community, and the environment. Now, the readings and provocations were wonderful, but the same materials in different hands would not have resulted in the gilded experiences we all had. 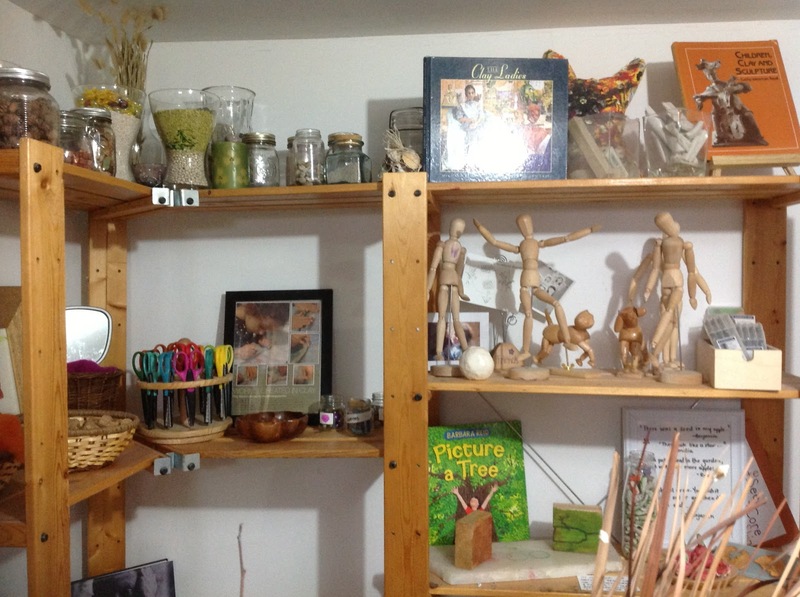 This alchemy was made possible by the professional combination of Diane Kashin and Louise Jupp, two fearlessly unconventional professors whose depth of admiration for and knowledge about the Reggio Emilia schools is clearly evident. When they speak of the founders of the Reggio Emilia movement to transform schools, it is as though they are speaking about treasured lifelong friends. This passion for the subject at hand would not be enough to make these teachers stand out, however, for who hasn't been to professional development and left overwhelmed by a died-in-the-wool presenter who manages to make the task goal seem unattainable? Upon reviewing the photos I'd taken, I was struck by how few photos I had managed to take of either Diane or Louise "teaching". There they were, here and there, playing with light, taking photos, smiling, talking to kids, indistinguishable from the rest of us learners. This, to me, was a light-bulb moment: they designed and facilitated the course as a model for how we teach when we're at our best. In a classroom full of diverse learners, it is never possible to meet the immediate needs of each, all at once. It is, however, entirely possible to set up a community of learners who take care of one another, who respect another's needs and interests, and who collaborate with shared ideas, materials, and efforts. And so it was, on the Monday, that we participants arrived from near and far, and we were warmly greeted and made to feel welcome: welcome to stop and chat with friends we knew only online, or to start with the beautiful breakfast spread out in the kitchen, or to take a tour of the Acorn School building and grounds. I stopped for breakfast, needing to eat but also to put names to faces as people came in. A socially curious person, I am not able to tune out interesting, new people in my vicinity even if the aesthetic environment is engaging. Others quickly walked off for a tour, pulled by the exquisite creations and documentation adorning every wall and available space. We were not rushed in, gathered together to sit and listen to "our teachers". Hmm. I've been doing that every year, having students say their emotion-filled goodbyes to families, and then gathering for a song circle on the carpet right away. Certainly I need to take attendance, and then I like to come together in a silly way to show that it's a fun, safe environment. Now I question that need to rush together and count heads. 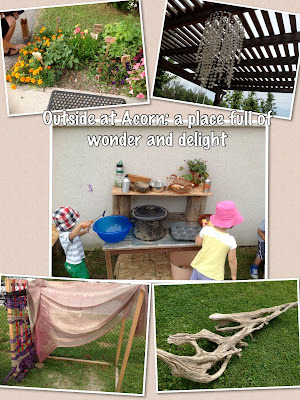 A classroom that is a place for wonder invites exploration. Surely I can take my time, let new friends explore the room, perhaps asking the seniors to be tour guides, offering assistance and helping to mark out boundaries and safety concerns when they come up. The first of hundreds of photos I took over the week-long course. 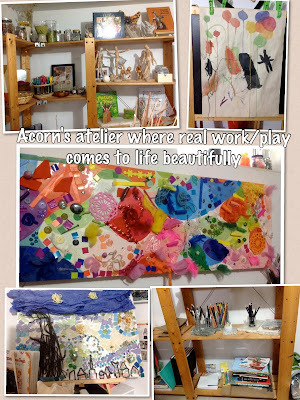 The atelier at Acorn quickly captured my eye. What happened that Monday morning is that we were welcomed, given what we needed (food, directions, clarification), and then allowed time to explore as our curiosity demanded. When we did come together, all squeezed together in the lovely Kindergarten room, we followed the conversations we'd struck up while exploring. Everyone seemed to be engaged in talking to a new friend, chatting and sharing observations about what they'd seen that morning. 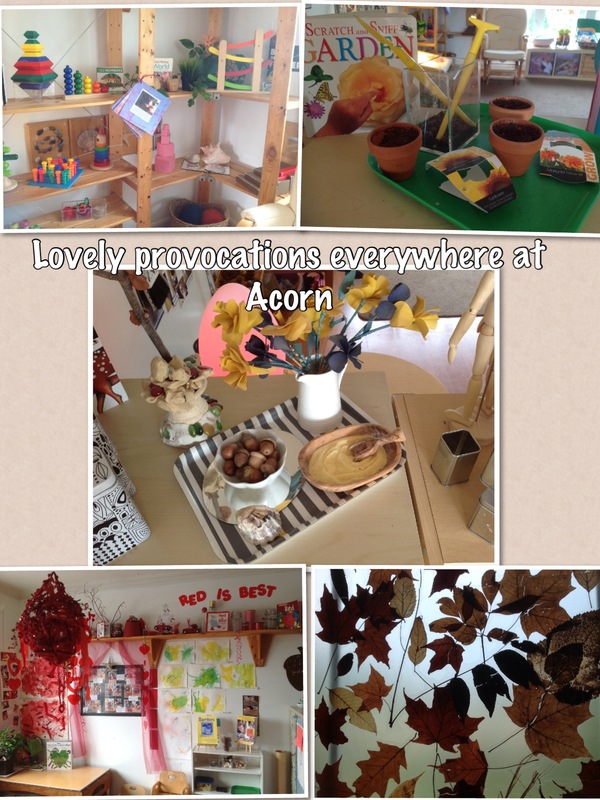 We were introduced to our partners in the learning, the wonderful staff at Acorn school. I don't recall much of the introductory conversation, as I was beginning to reach sensory overload with the multitude of invitations all around me, including above my head. And that leads naturally to the second aspect of the course that made it so transformational. It is an oft-heard phrase: "the environment is the third teacher". The first time I encountered that phrase, perhaps three years ago, I thought of environment as the static make-up of a room: the shape, the furnishings, the windows and doors and such. It took years of reading and hearing about Reggio Emilia schooling to grow a more nuanced understanding of the phrase, one I assume will change again as I continue to reflect upon my practice. Now it seems to me that the environment is a living space, a structure but also the elements within the structure: light, space to move, living and non-living materials, textures, colour, sound, feel. Then the phrase took on more meaning this year, as I began to see the sparks and provocations of daily class life as part of the environment. 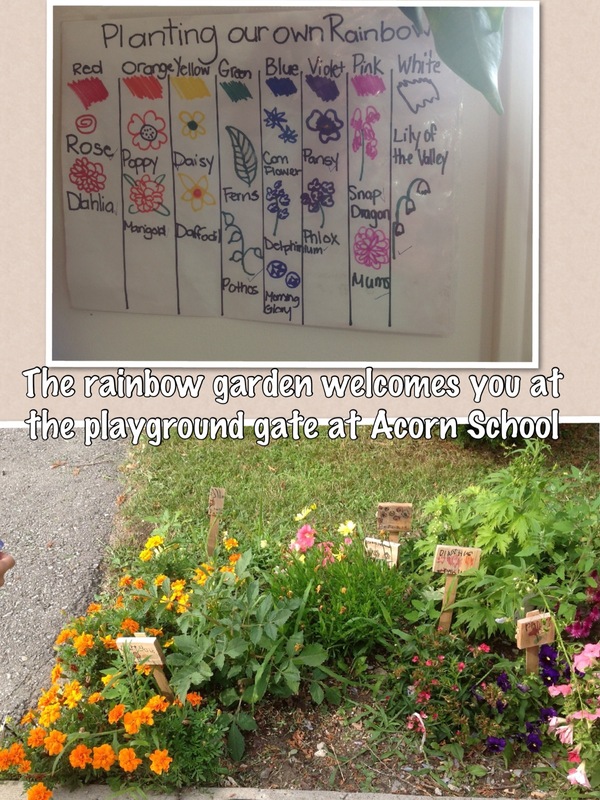 By bringing us together at Acorn School, our hosts were inviting us to play. Before I can describe our first invitation, I would like to share some images to explain why it is I could barely sit in my seat. My curiosity surrounding new colleagues piqued, coffee consumed, introductions made, now I began to crane my head like a child at a parade, unable to see everything and practically jumping out of my chair to go touch something. I hope the photos are able to capture some of the engaging nature of this wondrous place. 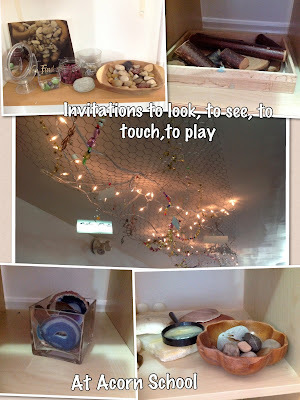 In the Kindergarten room at Acorn school, invitations to explore are everywhere! Those above I could see before even leaving my seat, along with an intriguing chart about planting a rainbow which I included below with the garden it resulted in. 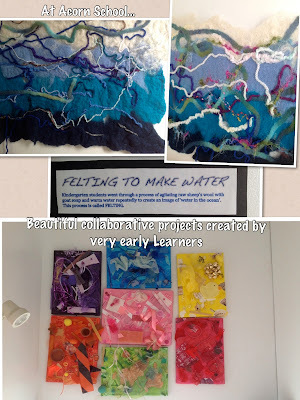 The rest of the collages required a walk around inside the school. 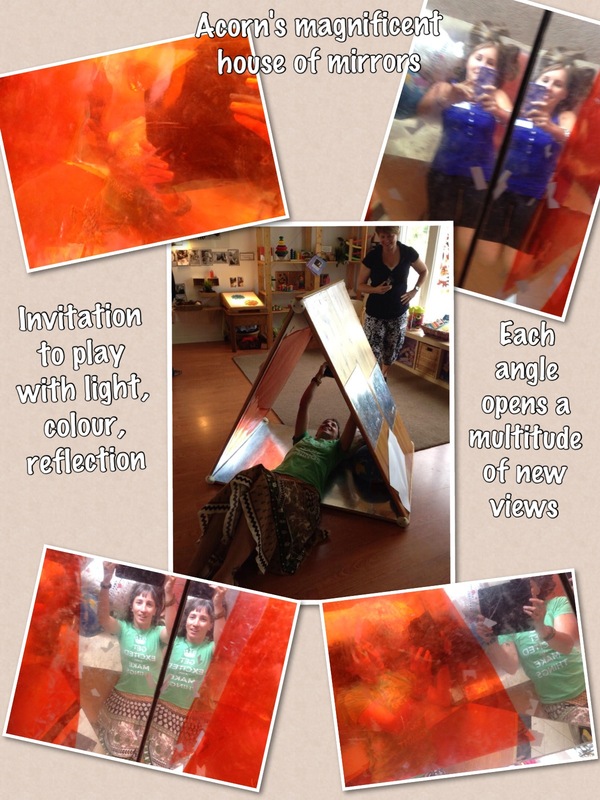 A note about the photos above: I was watching everyone walk around, admire, even look inside the mirrored triangle. I couldn't believe they could resist the temptation to get inside. I certainly couldn't! Julie (upper right; she crawled in after me) took the middle photo. It is an amazingly simply piece of furniture (and Rosalba later told us the story of its creation) that leads to such wonderful observations about perspective, point of view, image of self, light, colour... a place for wonder. A conspicuous absence is the engaging documentation everywhere in the various classrooms. In order to respect student safety and privacy, none of those images are available. I did want to share the environment, though, because it is here that I see those two familiar ideas come to life to beautifully: nothing without joy, and the environment is the third teacher. What followed our free exploration was both familiar and new, an invitation to explore the local natural spaces with the group and to gather materials for later exploration. It is a story for another post. Thanks for sharing your experience. :) Sometimes I want to share some photos or what not to show the level of documentation we do at a Reggio inspired school, but I can't because I want to be respectful of the children and families. Thank you for your comment. I'm just sorry I haven't peeked in at my posts to respond for too long. 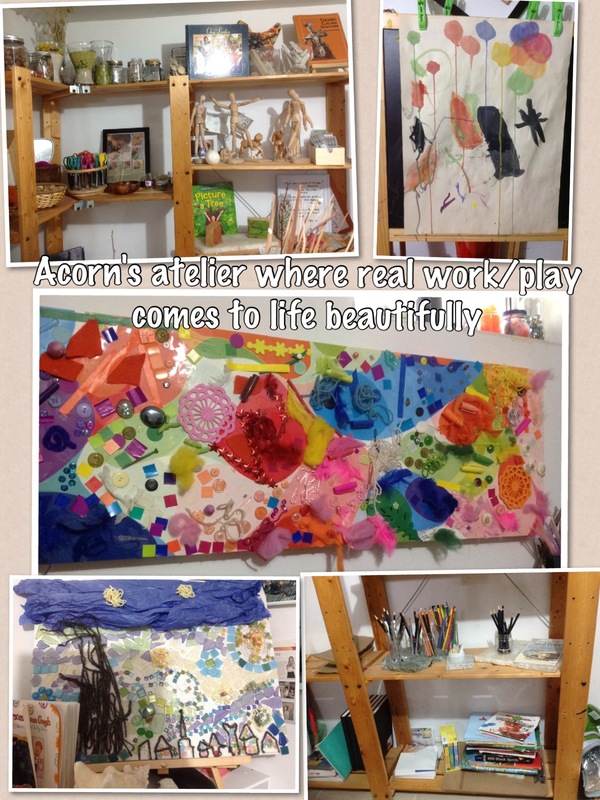 My every visit to Acorn leaves me filled with such awe. Such a space of joyous learning! Of course, I completely understand the dance between privacy concerns and respect for such on one hand, and the beauty of sharing, making learning visible to the families and greater community on the other hands. With my class twitter account I strive to share the learning, the quotes and processes that go Into our daily learning, while not showing identifying features. No names are attached, faces are always cropped unless impossible, which is when I use "touchblur" app. Within the classroom, though, students at work and play are always asking for the camera or for me to take a picture/video of their explorations. If may parents weren't on board, I wouldn't be using the photographs in this way. At our recent interviews, one comment that came up again and again was how much families appreciated the window into our classroom that the twitter feed offers. That's when I knew I'd made a good leap, this year, though I never knew how powerful it would be when I began!